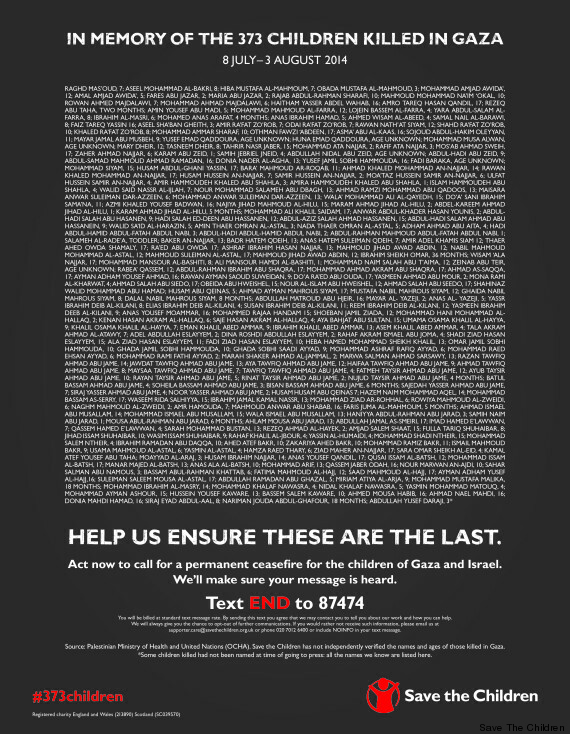 A list of the 373 children killed in Gaza, some just a few months old, has been published in national newspapers today as David Cameron faces mounting pressure over Britain’s response to the offensive that has claimed the lives of close to 2,000 people, mainly Palestinian civilians. Save the Children took out the full-page advertisements saying it wanted to remind “the world of the urgent need to push for a permanent ceasefire”. 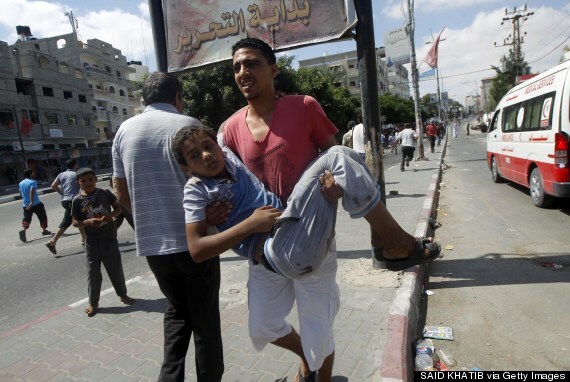 A three-day truce began yesterday with both Israeli forces and Palestinian group Hamas stopping cross-border attacks. At home, Cameron is coming under fire from from within his own party to step up and challenge Israel over its handling of Gaza. Foreign Office Minister Baroness Warsi yesterday quit the government after claiming its policy on Gaza was “morally indefensible”. Save the Children’s chief executive Justin Forsyth said the deaths of almost 400 children over the last four weeks are “an outrage”. “To see the names of the children, some as young as a few months, written in stark black and white brings home the tragedy that has befallen Gaza’s children,” he said. “One child’s death is too many; 373 is an outrage that is a stain on the world’s conscience. “We condemn all indiscriminate attacks on civilians in Gaza and Israel and by publishing these names, we are reminding the world of the urgent need to push for a permanent ceasefire. Tory MPs have lined up to criticise Cameron in the wake of Warsi’s resignation, with The Times (£) calling it a “Tory War Over Gaza” on its front page today. Alistair Burt, a former foreign office minister, said Israel’s actions were “unjustifiable” and it was “losing the moral argument”. Parliament’s cross-party International Development Committee said today that controls on the movements of Gazans – who are rarely allowed to leave the territory – were not “proportionate” and in some cases ran counter to international law. It urged the government to do what it could to persuade the Israelis to improve the supply of water and electricity which are frequently cut off. The committee – whose members visited Israel and the Palestinian Territories earlier this year – said they were “shocked” by what they had seen. They warned that its policies were ultimately likely to prove counter-productive. “We saw a country whose people have known immense suffering now imposing conditions on their Palestinian neighbours which cause a different but very real suffering and often without real security justification,” the committee said. The committee also questioned evidence provided to it by the Israeli Embassy in London following their visit. “Some of the evidence we were given on our visit are difficult to reconcile with that subsequently provided by the Israeli Embassy,” it said. A government spokesman said: “We welcome the International Development Committee’s strong support for our work on economic development in the Occupied Palestinian Territories and agree that sustainable development can only happen if economic restrictions are eased. “We will continue our work to help strengthen Palestinian institutions and build a prosperous and stable future Palestinian state.